Did you know yesterday was the 150th anniversary of Alice in Wonderland? On July 4th 1862, Lewis Carroll first told this story to Alice Liddell his inspiration for Alice in Wonderland. The story was later published in 1865. It is certainly one of my favorite books! They celebrate the "Alice's Day" or the anniversary of Alice in Wonderland in Oxford, UK every year. I got to attend to Alice's Day back in the summer of 2007 when I visited England. I must thank my friend across the pond for the reminder about the anniversary! I told them about how I was going to have an Alice themed post, and they wondered if it was coincidence or if I had remembered it was the anniversary. It was purely coincidence, but I'm glad I was reminded! In honor of Alice in Wonderland I have an Alice themed polish for you today made by Once Upon a Polish. 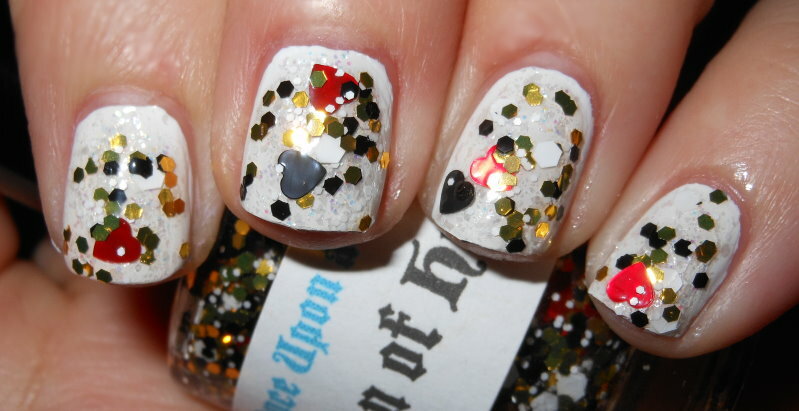 Queen of Hearts is a mixture of red hearts, black hearts, large white hex glitters, medium hex gold, medium hex black, and small hex white glitters in a clear base. I know that was a mouthful! I can officially say this has been added to my Top 20 of 2012 polish list. This glitter is awesome. I love the colors and the variety of glitters. Once Upon a Polish does an amazing job of capturing the essence of her polish ideas and putting them in a bottle. There is no doubt this is Queen of Hearts! I know Once Upon a Polish is on vacation, but make sure to bookmark her etsy store. I'm sure she'll have more goodies when she gets back. Remember- Jam tomorrow jam yesterday, but never jam today! If you want to read more on Alice's Day check out their site. If you're in the UK, and near Oxford it's taking place this weekend, so it maybe fun to check it out! Oh wow, I LOVE this. I'm such a sucker for obnoxious glitter! That's a whole lot of 'stuff' in this little bottle! Fun looking! Gorgeous glitter! I really like it. I actually got Alice in Wonderland for Christmas, so I definitely want to read it soon. 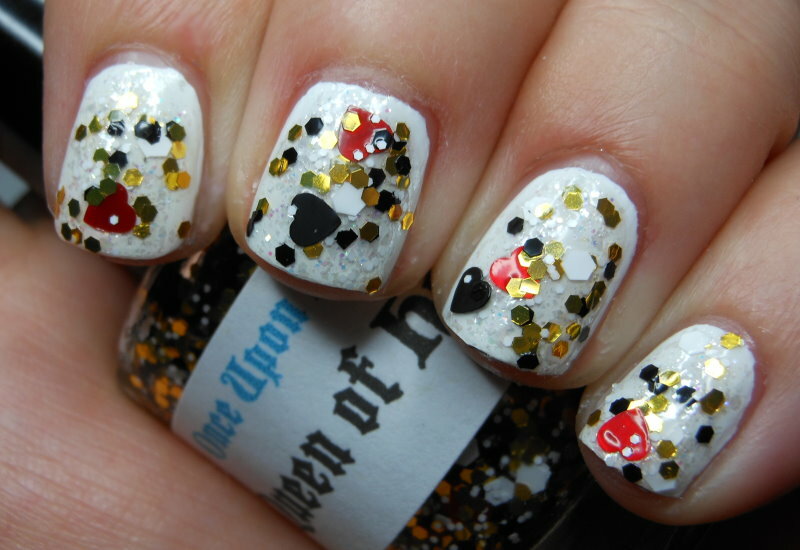 Fun polish - it reminds me of casinos. I'm with you on the 1985 film, and Jam Tomorrow is definitely a highlight ;) Happy AiW anniversary! LOL, now that's a fun polish - looks great! I have always been so pleased with Once Upon a Polish! This is no exception, a fun many dimensional look! Wow, what an awesome glitter! I remember that TV version! This mani is out of the park!!!! There's nothing else like this one...wow!! I loved those movies so much!! !